The house sleeps up to 10 people in 5 bedrooms all with ensuite bathrooms. Bedrooms are fairly equal in size and style (one is on the ground floor, 4 are on the upper floor) and all beds can be made up either as twins or as large doubles. All bedrooms have air conditioning. The ground floor is mostly open concept with entrance foyer, living room and kitchen, both of which also open to the outdoors, terraces and pool area. There is also a pool table, quest toilet and laundry facilities. One bedroom is on the ground floor. On the upper floor there are four additional bedrooms as well as another living space with television. There is a large terrace here with panoramic views. Clothes washer and dryer and iron. Hairdryers. Daily cleaning except on Sundays. Bed linens changed once a week. Breakfast and cook services available. Swimming pool (33x15ft with swimming current), terraces, including table for dinner, BBQ, sun lounges. 50 acres of grounds and gardens. Local village 1 minute drive, 10 minute walk, La Selva 5 min. by car, 10min by bike, 20 min. walking, Pollensa or Palma 30 min; Soller Valledemossa, 45 min. NOTE. There is another property near la Selva (150yds and you face away from it), but there has never had an issue with privacy. la Selva is the epitome of style and comfort, a sublime retreat for five couples, ideally located for cycling. ​Conveniently located near the centre of the island (and the wine making area) you are only a 30 minute drive to beaches or to Palma. 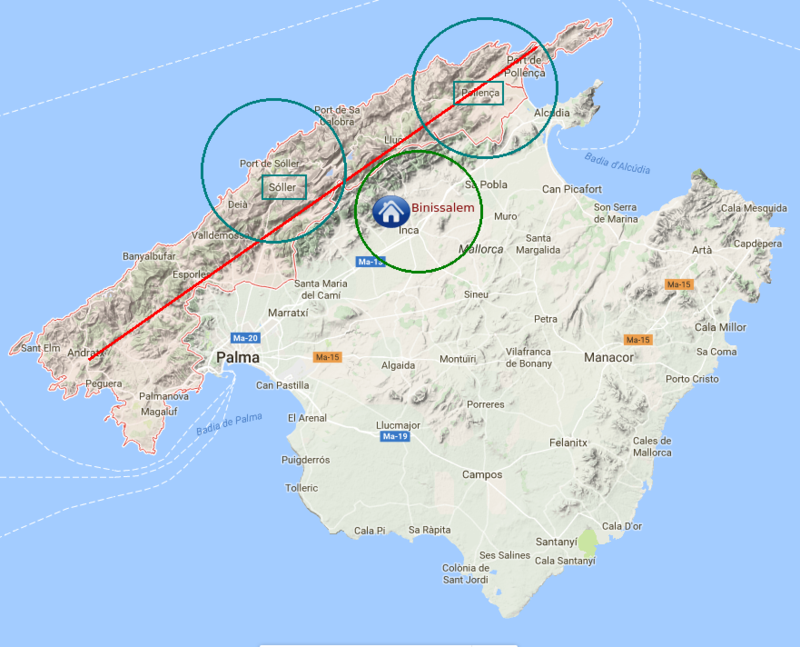 From the upper terraces you can the Tramontana mountains and all the way to the ocean and Alcudia Bay. The area around la Selva is ideal for a mixed group of cyclists (and we never give perfect 10s). You are centrally located and so strong riders have access to all the island's most famous cycling routes. But the flat and rolling terrain of the surrounding farmland and vineyards affords a wide variety of less demanding routes too. All the major cycling attractions of the island withing reasonable reach. The round trip to the top of the famed Sa Calobra climb is just 42km round trip (then add 2x13kms for the down and back up.) All in all, a pretty perfect hilly 68km route. The super scenic Cap Formentor route is 90kms return, and can be reached via either a hilly or a flatter route. Recreational cyclists have excellent flatter routes right out the door, exploring the quiet stone wall-lined lanes that weave through the vineyards and farm land. In brief, the Inca area works well for both Performance AND Recreational cyclists.